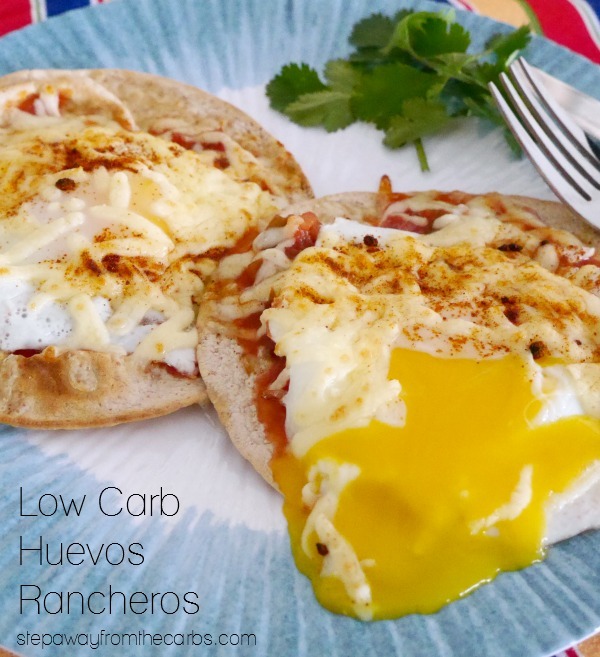 This amazing Low Carb Huevos Rancheros dish is a fantastic way to start the day! Every now and then a combination of factors come together that allows me to cook myself a really lovely breakfast. The last time I cooked it was a Sunday morning, and this recipe really set me up for the day! Under a broiler, lightly heat a couple of low carb tortillas until warmed through and starting to puff up. 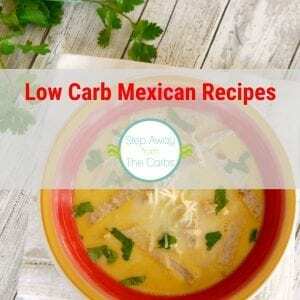 I use the small low carb ones from Mission with only 3g net carbs per tortilla. 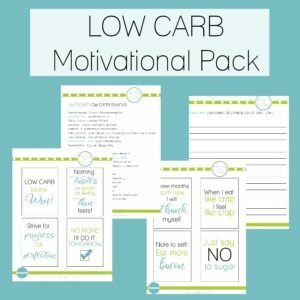 But one big low carb tortilla would work just as well. 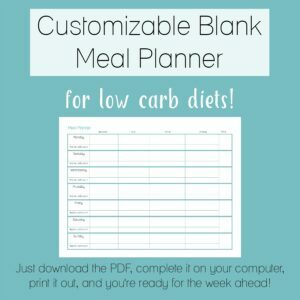 Oh and put them on my fave silicone mat for easy clean up! While the tortillas are warming, fry two eggs until the egg white has nearly set on top. Spoon some salsa (I use a generic mild one but there are some salsas from Netrition that are even lower in carbs) over the tortillas. 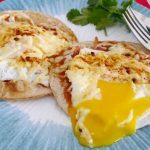 Carefully place an egg onto each tortilla, and sprinkle with shredded cheese (I use Chihuahua as it melts fast and has great flavor). I usually sprinkle some chipotle powder over the top for extra heat, but if you’re using a spicier salsa then you may not need it. Pop them back under the broiler just long enough for the egg to set on top and the cheese to melt. Garnish with fresh cilantro for a colorful finish. The combination of the spicy chipotle, crispy tortilla and the warm egg yolk mixing with the salsa is absolute heaven!! Under a broiler, cook the tortillas until warmed through and starting to puff up. Put aside. Fry two eggs until the white is nearly cooked on top. Spread salsa onto the tortillas and top with an egg. Sprinkle cheese and chipotle powder (if using) over the egg and return to the broiler until the cheese has melted and the top of the eggs are cooked. 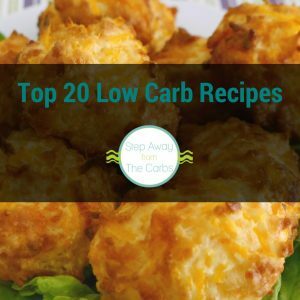 9g net carbs per serving (entire recipe) based on using low carb tortillas that each have 3g net carbs. 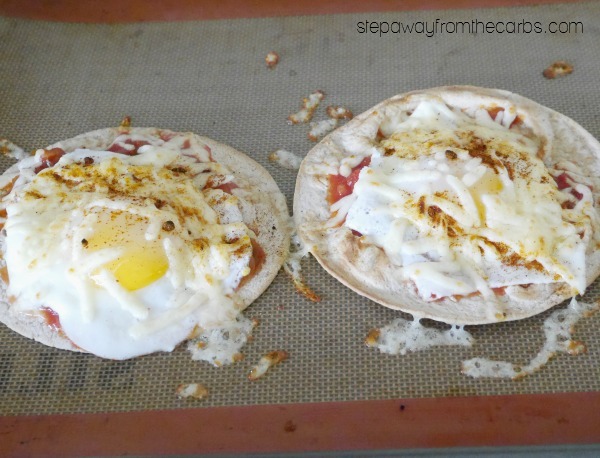 I’ll probably end up putting both my eggs on one wrap (less carbs), but this looks like a good alternative for toast!